I’ve heard stories on NPR about insufficient state funding of heroin treatment facilities. I’ve heard about plans to make Narcan injections available to iv drug users, for overdoses. Another popular angle I’ve seen repeated multiple times (and one currently pushed by the US Drug Enforcement Agency) claims prescription narcotics became harder to get, so users switched to heroin, instead. The world supply of opium increased 5-fold between 1980 and 2010, according to the UN.“Afghanistan account[s] for around 90% of global illicit opium production in recent years. By itself, Afghanistan provides 85% of the estimated global heroin and morphine supply, a near monopoly.”(see pp 37-38). Despite the (now) US $8.4 billion spent to defeat this trade, it just keeps growing. The costs of US reconstruction efforts in Afghanistan total “$110 billion, after adjusting for inflation, [which] exceeds the value of the entire Marshall Plan effort to rebuild Western Europe after World War II” according to the Special Inspector General for Afghanistan Reconstruction, speaking in May 2015. Only 1.2% of the acreage used for Afghan opium production (est. 224,000 hectares) was eradicated in 2014, according to the UN. Also according to the UN, Burma is the world’s second largest producer of opium, currently growing only about 10% as much as Afghanistan. But Mexico has been increasing production. According to the UN World Drug Report, in the 1990’s Afghanistan supplied opium that was converted into half the world’s heroin production. By 2010, it supplied 90% of the total. But the DEA, White House and other official US sources claim that US heroin derives almost entirely (96%) from Latin American opium (based on seizures of shipments); the DEA in 2014 claimed that Latin America was the source for the vast majority of US heroin, with southwest Asia (i.e., Afghanistan) accounting for only 4% of US heroin in 2012. This is highly unlikely. In 2008, the UN estimated that the US and Canada accounted for 13% of global heroin use. With about 95% of global heroin derived from Afghanistan, Burma, Thailand and Laos, Latin America (mainly Mexico with a small amount from Colombia) does not produce enough to supply the majority of US heroin, let alone 96%. In fact, the White House Office of National Drug Control Policy undercuts this claim when it says Mexico had 10,500 hectares under poppy cultivation in 2012, while Afghanistan alone had 154,000 hectares in 2012 and 224,000 hectares in 2014, per UN estimates. This DEA claim, based on heroin interdiction, suggests a different explanation. Perhaps heroin shipments from Afghanistan are at lower risk of being seized than heroin coming from Latin America. Might some be entering through government channels, when so much materiel and so many personnel (soldiers, aid workers, diplomats and contractors) fly directly between the US and Afghanistan? Congruent with the US occupation of Afghanistan, Afghanistan expanded its opium production, and the global supply of heroin increased dramatically. The price dropped as a result. New buyers entered the market. And the US now has several hundred thousand new addicts. Russia and Europe have even more. The resulting social problems are hugely tragic and hugely costly for millions of families, and for our societies as a whole. If we start being honest about why there is a major heroin epidemic, maybe we can get serious about solving the problem with meaningful eradication and interdiction. Aerial spraying of crops with herbicides or similar methods has been prohibited in Afghanistan, but it works. In 2014, Britain’s former Ambassador to Afghanistan (2010-2012) called for legalization and regulation of illicit drugs as one means of attacking the problem. Serious measures are needed. Total world production of opiates always gets consumed: historically, the market for opiates has been extremely elastic. 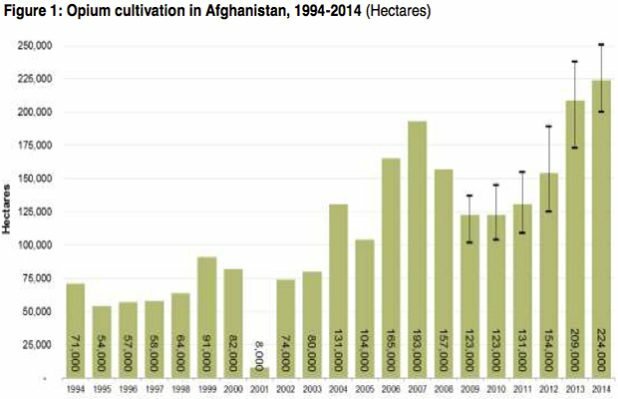 Land under poppy cultivation (in Afghanistan, Southeast Asia’s Golden Triangle and Mexico) continues to increase. Without meaningful efforts to reduce opium production and entry of narcotics into the US, the epidemic of heroin addiction may become a considerably bigger problem than it is today. I will have more to say about the subject of heroin in a later post.